At Clifton & Mauney Orthodontics & Pediatric Dentistry, we pride ourselves on providing high quality orthodontic care in a fun, friendly, and relaxed office environment. Our doctors and highly trained team of orthodontic specialists work hard to design specialized treatment plans for every patient, utilizing a wide range of procedures and technologies to perfectly suit every patient's unique orthodontic needs. We take pride in using only the latest in orthodontic technology at our office, which is why we're excited to offer our patients Invisalign, a unique alternative to metal braces. Oral Hygiene: Because aligners can be easily removed to brush and floss, maintaining proper oral hygiene is as easy as ever - something critical for successful orthodontic treatment. 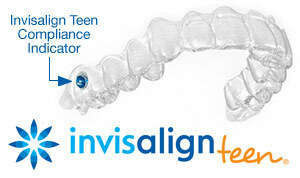 Improved Appearance: Invisalign aligners are translucent, making them virtually invisible when worn. There's no need to worry about school pictures, social functions, or presentations at work! No Dietary Restrictions: With traditional braces, patients must forego certain foods to avoid harming their appliances - but with Invisalign, you can still eat all your favorite foods without worrying. Ease & Comfort: Without metal brackets and pointy wires, this is a comfortable treatment that won't irritate soft tissues in the mouth. Protection from Grinding: The aligners also function as night-guards, safeguarding your teeth from nightly grinding. While in the past Invisalign was only available for a small range of conditions, improvement in the technology now enables us to treat most conditions with Invisalign. We'll work with you to find out if Invisalign is the right solution for you. The process is simple - first, we'll take detailed measurements of your mouth and use specialized computer software to design a comprehensive plan for moving your teeth into optimal positions. Based on this plan, we'll manufacture a set of pairs of aligners - as few as 18 or as many as 36. You'll wear each pair for at least 20 hours a day for about two weeks, then move onto the next set. With each new pair of aligners, your teeth will move closer to their ideal position until you have a beautiful new smile! Thanks to recent advances in the technology, aligners now come with special "eruption tabs" that hold open space for molars that haven't fully grown in - this allows us to treat many more patients using Invisalign. Additionally, Invisalign Teen, which is designed specifically for teenage patients, comes with built-in "compliance indicators," which demonstrate whether or not the aligners are being worn enough. These advances make Invisalign more available and effective than ever.